The Rosary ( Latin : rosarium , in the sense of "crown of roses" or "garland of roses", usually in the form of the Dominican Rosary , is a form of prayer used especially in the Catholic Church named for the string of prayer beads used to count the component prayers. When used of the form of prayer, the word is usually capitalized ("the Rosary"), as is customary for other names of prayers, such as "the Lord's Prayer ", "the Hail Mary ", "the Magnificat ". 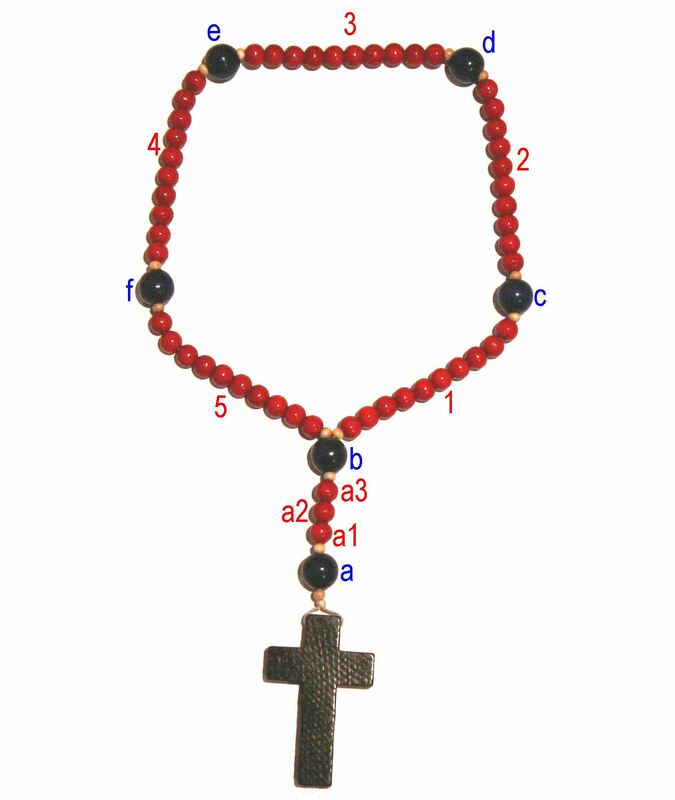 When referring to the beads, it is normally written with a lower-case initial ("a rosary"). The prayers that essentially compose the Rosary are arranged in sets of ten Hail Marys with each set preceded by one Lord's Prayer and followed by one Glory Be . During recitation of each set, known as a decade, thought is given to one of the Mysteries of the Rosary , which recall events in the lives of Jesus and Mary . Normally, five decades are recited in a session. Other prayers are sometimes added after each decade (in particular, the Fátima Prayer ) and before (in particular, the Apostles' Creed ), and after (in particular, the Hail, Holy Queen ) the five decades taken as a whole. The rosary as a material object is an aid towards saying these prayers in the proper sequence. A standard fifteen Mysteries of the Rosary, based on the long-standing custom, was established by Pope Pius V in the 16th century, grouping the mysteries in three sets: the Joyful Mysteries, the Sorrowful Mysteries, and the Glorious Mysteries. In 2002 Pope John Paul II suggested a new optional set of five, called the Luminous Mysteries, bringing the total number of mysteries to twenty. For over four centuries, the rosary has been promoted by several popes as part of the veneration of Mary in Roman Catholicism . The rosary also represents the Roman Catholic emphasis on "participation in the life of Mary, whose focus was Christ", and the Mariological theme "to Christ through Mary", taught by Saint Louis de Montfort . Whoever shall recite the Rosary devoutly, applying themselves to the consideration of its Sacred Mysteries shall never be conquered by misfortune. God will not chastise them in His justice, they shall not perish by an unprovided death; if they be just, they shall remain in the grace of God, and become worthy of eternal life. Saint Louis-Marie Grignion de Montfort (31 January 1673 – 28 April 1716) was a French Roman Catholic priest and Confessor. He was known in his time as a preacher and was made a missionary apostolic by Pope Clement XI. You at least try to console Me and announce in My name that I promise to assist at the moment of death, with all the graces necessary for salvation, all those who, on the First Saturday of five consecutive months shall confess, receive Holy Communion, recite ftve decades of the Rosary, and keep Me Company for fifteen minutes while meditating on the fifteen mysteries of the Rosary, with the intention of making Reparation to Me. "There is no surer means of calling down God's blessing upon the family than the daily recitation of the Rosary." "Those who say the Rosary frequently and fervently will gradually grow in grace and holiness and will enjoy the special protection of Our Lady and the abiding friendship of God." 1. Have Masses offered for them. 2. 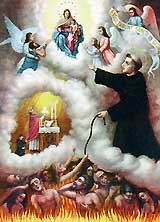 Pray the Rosary and and the Chaplet for the Holy Souls. 4. Offer up little sacrifices and fast. 5. Spread devotion to them. 6. Attend Eucharistic Adoration and pray for them. 7. Gain all the indulgences you can, and apply them to the Holy Souls. 1st to the 8th of November; on other days of the year it is partial. A plenary indulgence, applicable only to the Souls in Purgatory, is granted to the faithful, who on the day dedicated to the Commemoration of all the faithful departed piously visit a church, a public oratory or ----- for those entitled to use it ----- a semipublic oratory. pious meditation on a particular mystery of our Redemption." Eternal rest grant to them, O Lord, and let perpetual light shine upon them. May they rest in peace. Partial indulgence, applicable only to the Souls in Purgatory. May it please Thee, O Lord, to reward with eternal life all those who do good to us for Thy Name's sake. Amen. while we yet live on earth and if, we should go there. When praying the Rosary, reserve, if possible, one decade to pray for these Poor Souls. If you are able, say an entire Rosary exclusively for their release, at least in November. and the Church suffering in Purgatory. Eternal rest grant unto them, O Lord; and let perpetual light shine upon them. Requiem aeternam dona eis Domine; et lux perpetua luceat eis. Requiescant in pace. Amen . MOST loving Jesus, I humbly beseech Thee, that Thou Thyself wouldst offer to Thine eternal Father in behalf of the Holy Souls in Purgatory, the Most Precious Blood which poured forth from the sacred Wounds of Thine adorable Body, together with Thine agony and death. And do thou likewise, O sorrowful Virgin Mary, present unto Him, together with the dolorous Passion of thy dear Son, thine own sighs and tears, and all the sorrows thou didst suffer in His suffering, in order that, through the merits of the same, refreshment may be granted to the Souls now suffering in the fiery torments of Purgatory, so that, being delivered from that painful prison, they may be clothed with glory in Heaven, there to sing the mercies of God for ever and ever. Amen . O God, Who hast commanded us to honor our father and our mother, in Thy mercy have pity on the souls of my father and mother, and forgive them their trespasses, and make me to see them again in the joy of everlasting brightness. Through Christ our Lord. Amen. O Most compassionate Jesus, have mercy on the Souls detained in Purgatory, for whose redemption Thou didst take upon Thyself our nature and endure a bitter death. Mercifully hear their sighs, look with pity upon the tears which they now shed before Thee, and by virtue of Thy Passion, release them from the pains due to their sins. O most merciful Jesus, let Thy Precious Blood reach down into Purgatory and refresh and revive the captive souls who suffer there. Stretch out to them Thy strong right hand, and bring them forth into the place of refreshment, light and peace. Amen.